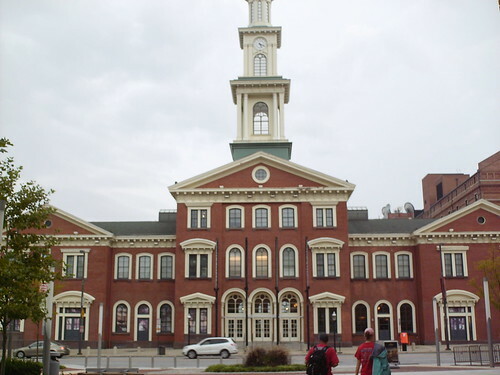 The Camden Station building, next door to the ballpark. 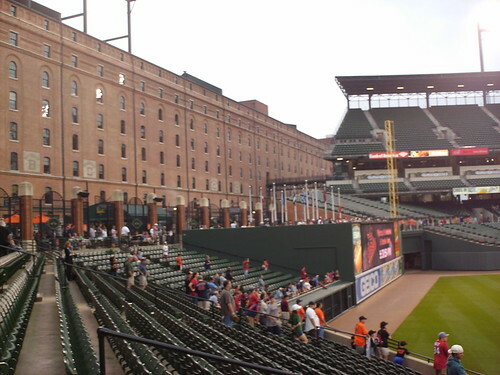 Now housing several museums, the building used to be the train station for the railroad yards after which Camden Yards is named. 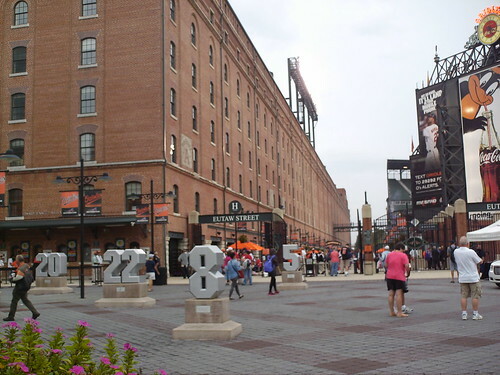 Retired number statues lead the way to the Eutaw Street gate. 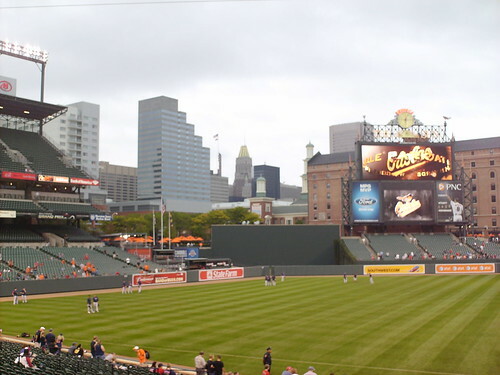 The B&O Railroad Warehouse, the distinctive feature of Oriole Park, is the longest building on the east coast, despite being only 50ft wide. 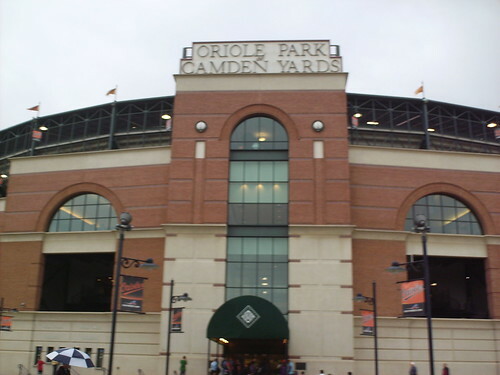 It now houses Orioles executive offices and team store. 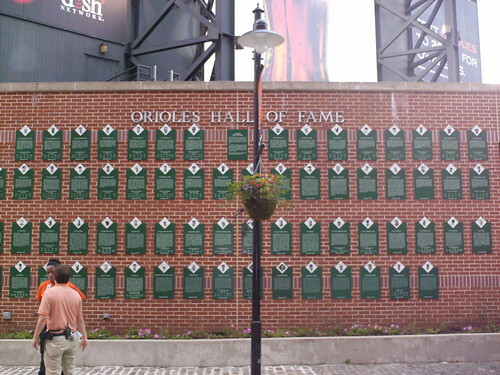 The Orioles Hall of Fame behind the scoreboard on the center field concourse. The flag plaza in center field. 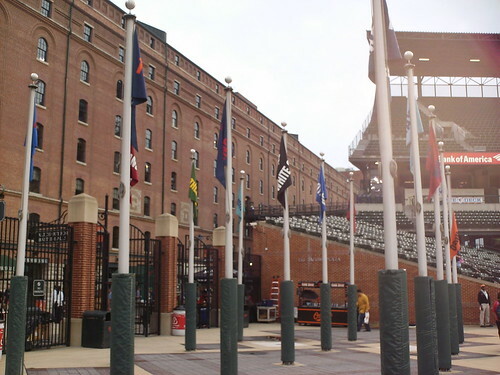 Flags represent each American League team, and are arranged in the current order of the divisional standings. 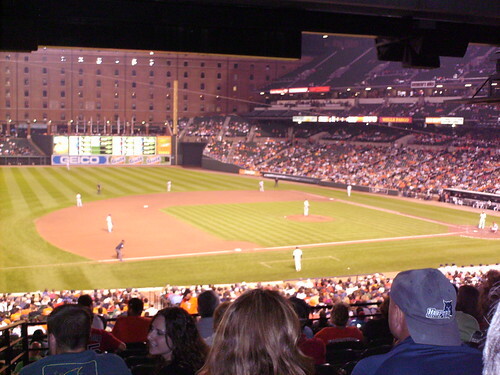 The Camden Yards grandstand, as seen from the center field bleachers. 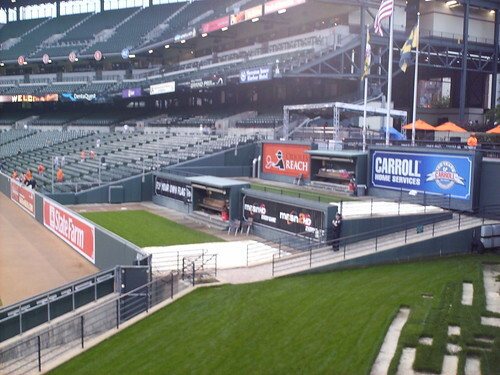 The double decked bullpens in left center field. 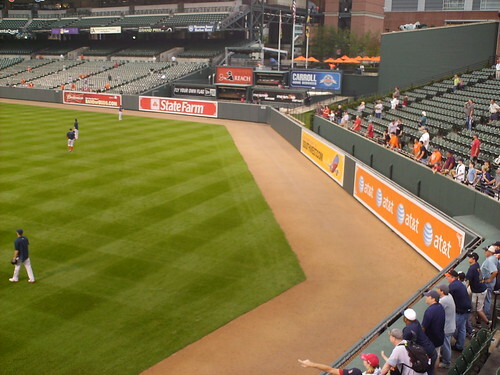 The home bullpen is at field level, and the visitors bullpen is stacked above it. The center field bleachers. The right field fence is only 318 feet from home plate, so the height of the wall jumps drastically at the flag plaza, providing a large surface for the out of town scoreboard. 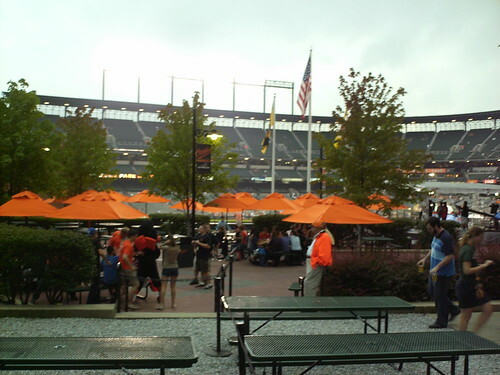 The bullpen picnic area in center field gives view of the field from right behind the flagpoles in center field. The outfield corners. 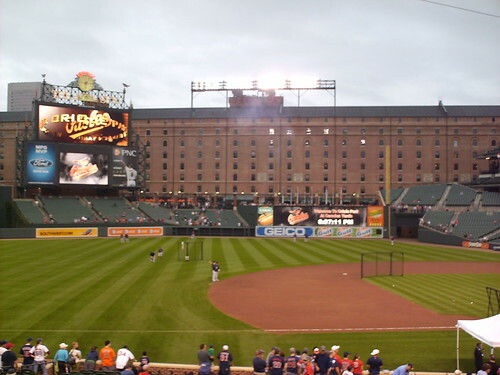 Camden Yards was the first of the "retro" styled ballparks that embraced unique corners and outfield dimensions, as opposed to the uniform, "cookie cutter" fields that had been popular the few decades before. 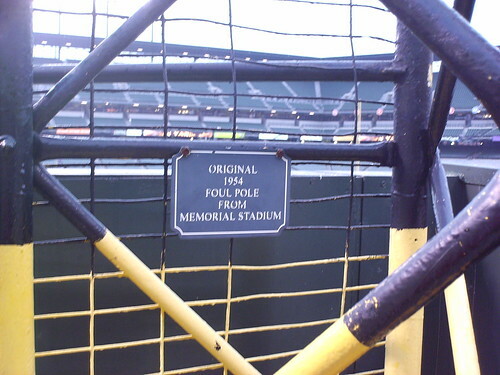 The foul poles are the original foul poles from Baltimore Memorial Stadium, the Orioles home before this park was built. The scoreboard in center field. 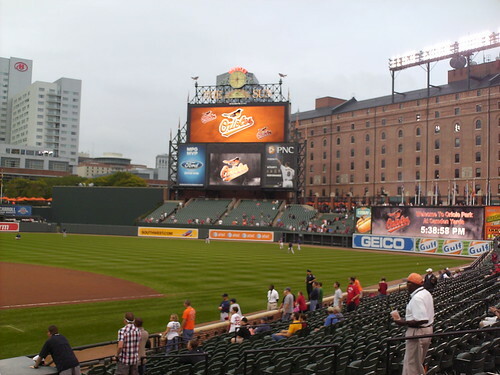 It is sponsored by the Baltimore Sun newspaper, but the large sign over the video board serves another purpose. The "H" in "The Sun" lights up to signal a hit, while the "E" lights up to indicate an error. 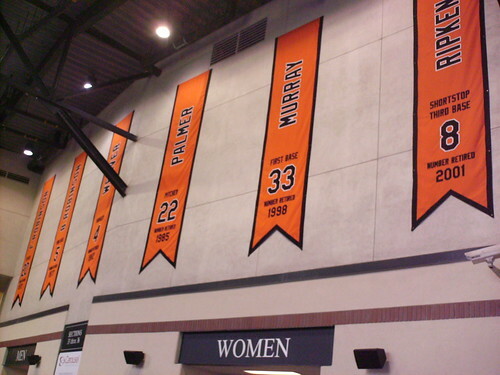 The inner concourse is lined with banners celebrating former players, championships, and other team and player accomplishments. 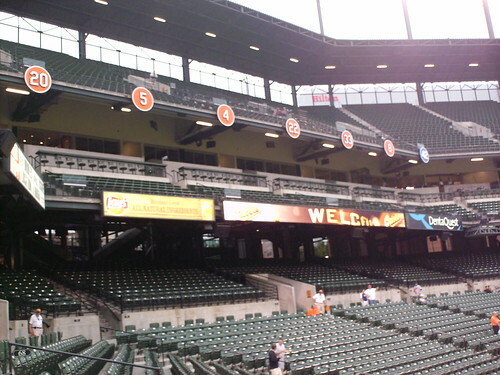 Orioles retired numbers along the facade of the top deck in left field. 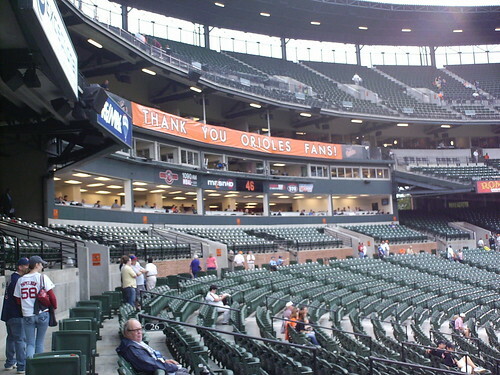 The press box at Camden Yards is located just below the second deck, lower than in many major league parks. 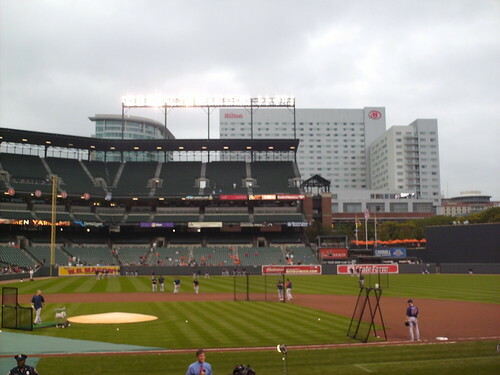 Downtown Baltimore as seen from inside the ballpark. 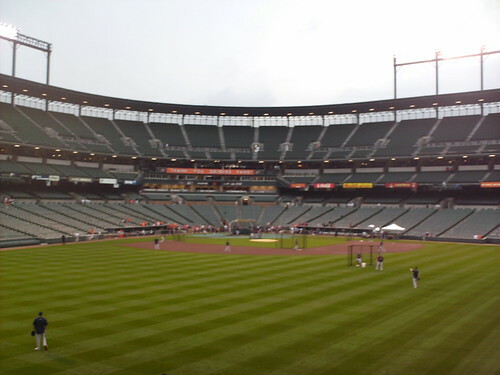 The view from behind home plate at Camden Yards. The view from down the third base line. The warehouse, which dominates the view, also acts as the right field light tower. The Laser Show. 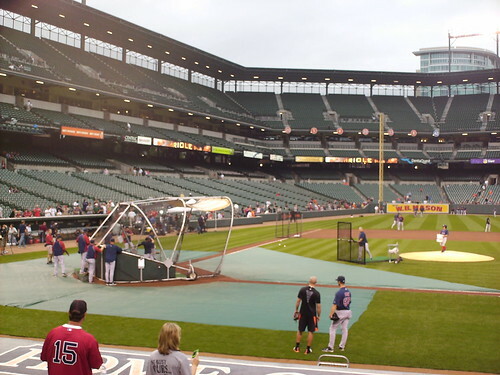 Dustin Pedroia takes batting practice before a game at Oriole Park. 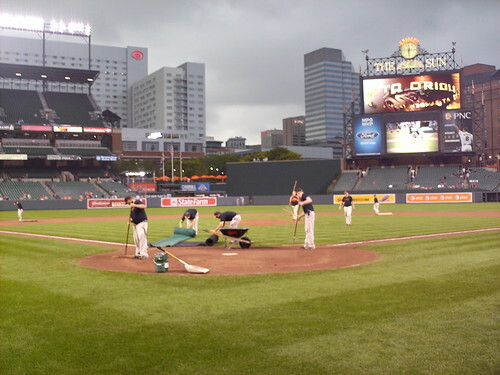 The Boston Red Sox and Baltimore Orioles on the field during a game at Camden Yards.